What’s the most pressing thing on your DESK? The first thing that's on my desk is this big card catalog that's raised my computer so I can stand while typing (laughs). I'm trying hard to produce a follow up to my book with Bert Dreyfus, my co-author for All Things Shining. It has a tentative working title called The Lofty Sway of the Dark and is about things that are dark in the sense that they're hidden from us, and we can't really get clear about them. We can't really rationalize them or understand them in a very articulate way, and it’s about how incredibly important it is to have things like that in our life. One of the ways of thinking about the relationship between this project and the last one is that we have two somewhat contradictory strains in our culture. One strain is the heritage that we get from Classical Greece, or from Greece before the Classical Period - Homeric Greece - which is really one of the foundations of the West in terms of our democracy, our literature, our philosophy and this was our focus in the last project. And the other strain, which is also old but quite different in motivation, is the strain from the Bible starting with the Hebrew Bible and through the New Testament. A great deal of the culture has been devoted, since the time of the early Christian period, to trying to bring these two strains together. In a figure like St. Augustine writing in the 4th Century AD, there is some attempt to read Christianity in terms of Platonic philosophy, and there are ways in which that's really a tension and that reading doesn't work. Then later in the 12th and 13th centuries, you get someone like Thomas Aquinas who tried to read Christianity in terms of Aristotelian philosophy. Our first book was primarily devoted to a reading of the Greeks and the Greek understanding of what's greater than or outside of us that we called 'the sacred,' and an account of what the Greek tradition thought you needed to do in order to allow yourself the possibility of a worthy life. What we were interested in was that the Greeks had this idea that you couldn't do that on your own. You couldn't do that without recognizing that in some of the best circumstances in your life, you experienced yourself in the context of something that was outside of you or bigger than you. 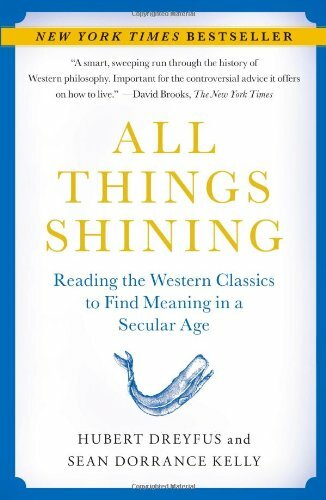 We called those moments 'shining moments,' and that's why the book was called All Things Shining. We weren't so interested in the metaphysics of Greek religion. We weren't really interested in the question of whether Zeus lives up on Mount Olympus, but we were interested in what it's like to experience yourself and your life in the context of an understanding of the sacred of the sort that they had. What do you hope to do with this new book? We want to say what's special about the Christian version of the sacred as opposed to the Greek version of the sacred, and we want to do that again not through trying to answer metaphysical questions about the existence of God or things like that but, rather, explore how you would experience your life differently if you were caught up in a certain kind of understanding of humanity and human existence and the sacred of the sort that Christianity focuses on, as opposed to the sort in which the Greeks were interested. The early Hebrew Bible is, of course, a kind of foundation for Christianity and that's one of the things in which we're interested. They were each giving something that we can now call an existentialist reading of Christianity. They weren't interested in the metaphysical questions about the existence of God. They were interested in how, if you were caught up in this Christian world, you might live your life differently, you might see the value of your life differently, you might see what stands outside of your life and grounds it differently than if you were caught up in some other understanding of the sacred. I think the answers to those questions are different if you're brought up in different cultures, but the answers that we have available to us are answers that come from these two traditions, and so those are the traditions we have to, so to speak, plunder. Are you exploring Westerners or Americans, specifically? Western civilization, more generally. Of course, there are differences, and there are extra resources in American history that are not so relevant to, say, English history or French history, but what we do share is that we live out of these two traditions: Greek and Hebrew/Christian. In All Things Shining, you are worried about the effects of social networking online. Does this carry over? Yes. I think we face challenges that manifest themselves in particular ways in our contemporary society that make them different kinds of challenges than the sorts that people dealt with in the 16th Century or in the 8th Century BC in Greece or in the Middle Ages in China. There’s a chapter in the earlier book about David Foster Wallace, and the chapter is intended to be very sympathetic at the same time that it's critical of the story he ends up giving about what the possibility of our salvation might be in these times. He really understood a lot about the challenges in our culture: about the onslaught of entertainment, about the onslaught of distractions, about the way in which we constantly have to fend off things that are really ultimately not that interesting in order to pay attention to things that are more interesting. David Foster Wallace called it 'the stomach level sadness' that characterized his generation, and there's a sense in which we have challenges that are organized around the world in such a way that it's making it harder and harder to do the things that we can recognize as worthwhile things. I don't think there's a real substantive answer to that, but there's a kind of formal answer to it. The formal answer is community practices, and we do try to address this in the last chapter All Things Shining. Practices to share with others that we're close to that have a kind of ritual component to them and that are organized around bringing out the best in ourselves and others. I think those kinds of practices can take many forms. If we manage to develop practices like that, then we'll live better lives. When did you think you were onto something? I thought I was NOT onto something in college. I started out doing math and computer science. There are lots of mathematicians in my family, and there are lots of mathematicians in my wife's family. I liked math, and I was good at math, but I felt like although it was really speaking to some aspect of me, there were things to which it wasn't speaking. I understood what was satisfying about it when it was satisfying: there's the development of certain kinds of skills, there's a certain kind of creativity, and there's the exploration of a certain type of domain. There are these 'ah-ha' moments which are extremely satisfying, the Archimedean kind of Eureka moments when all of a sudden you have a thought that you never knew you were going to have and there it is and it's given to you as a gift. It's amazing. I think I found those parts of it extremely satisfying. But I also felt that there was something that I wasn't addressing in spending all my time doing that, and I wanted to know what it was, and I think that's why I switched to philosophy. I immediately became interested in two philosophers: Hubert Dreyfus with whom I co-wrote the book and John Searle, who had in the '80s and '90s already become very famous for their criticisms of the artificial intelligence research program - a program in which I'd been involved. When I was trying to create programs that would do supposedly intelligent things, I felt I wasn't really learning anything about genuine intelligence. I wasn't really learning about what was interesting about me as a human being or anyone as a human being. Human beings are often said to be the intelligent beings, the rational beings - that's what characterizes our intellectual capacities. I thought I was going to be studying that when I was doing Artificial Intelligence, and it didn't feel like I was and I didn't know why. Dreyfus and Searle were both philosophers at Berkeley and became my advisors. I wanted to know what was wrong with this research paradigm. Why was it not generating any interesting story about the kinds of beings that we are? And I felt like I understood Johns Searle's arguments, which I think are incredibly clever, detailed, and interesting, yet I felt like there was still the question left. When I talked with Bert, I could never understand what he was saying and yet every time I asked him a question or gave him a challenge; he had something to say. I'm not convinced it was always something that he understood, but there was a really interesting conversation that ensued, and we were in different positions, and I felt like I was really learning something about myself and about this paradigm of research, and also about humanity. I realized that Bert was speaking out of a philosophical reading of the history of the West and contemporary issues in metaphysics and ontology and commitments about the nature of human existence that was incredibly rich. His arguments were based on readings by a German philosopher named Martin Heidegger who wrote in the middle of the 20th Century. His work was developed in a tradition in philosophy called the Phenomenological tradition in which I became really interested. I remember the moment when I was a junior faculty member at Princeton and I was trying to explain to one of our graduate students about some transformation that I felt could happen at a certain point when you become a philosopher, and it was the transformation from not really understanding what your next project was going to be to understanding every project you're engaged in as a project that's inadequate, insufficient, will never get everything that you need to say right and that you feel like you're speaking out of some inexhaustible ground. It was then when I realized that it is a kind of a transformation in the way you experience the world. Because, unlike math, there is a relief that things are unsolvable? It's not that you can't solve any of it, although the most interesting things are not the kind of things that admit a solution or not, you can say more and more and more and more every time. If you're good, you can say new and different and more interesting things each time. That’s because the world that you're describing is infinitely interesting and the beings that we are that are involved in that world are infinitely interesting, and you can approach them from lots and lots of different directions, and there will never be enough time to say everything interesting about it all. I think it's very different than the feeling you get in math because in math, at least at the minimal level I was able to do it, you do sometimes get these 'ah ha' moments, and they do come with a kind of self-certification. But if they seem to close the case, there is nothing more to think about. In philosophy, every one of these moments is a little sliver that opens up a whole new world, and the world that it opens up now looks inexhaustible and delightful in an infinite number of ways. That's a hard question, and I don't think I have a good articulate answer, but it has something to do with the importance of the arts and humanities in what's essentially a scientific or social scientific culture. I think that the arts and humanities give you a kind of satisfaction that's different from the kind of satisfaction that you can get through scientific explanations, and it's a hard-won kind of satisfaction. You have to work very hard just as you do in the sciences, but it's a different kind of work to develop the way of seeing the world that allows you to recognize the beauty of a Beethoven sonata or the sort of extraordinary depth of a painting by Cezanne or the real originality of a Dostoevsky novel. These are different kinds of satisfaction that I fear is being lost. I feel like it's harder and harder for people to recognize. I'm worried about our students. I want our students to be able to have that. If they're neurosurgeons or atomic physicists or Goldman Sachs people, I want them to be able to have the kind of pleasure and self-understanding that comes from real deep engagement with genuine humanistic projects, because I think that ought to be open to everyone. I am worried that in our culture - and maybe this is now more about American culture than some of the cultures in Europe, say, some of the Western cultures in Europe - I really feel like we're losing that ability to recognize the value and importance for each of us in these great humanistic traditions and projects. I understand Dr. Drew Faust, the President of Harvard University, is very committed to the arts in undergraduate learning, isn’t she? She's been doing good stuff. She had a Committee on the Arts, and I've been very involved in the Committee on the Humanities for which she's very supportive. At the same time, there was an article in the Crimson from the first week of classes that said that something like ten percent of the incoming class said they were interested in the arts and humanities which is much smaller than it has been in the past, and I think that's a problem. Doesn’t it come down to market forces? You need to make a lot of money to pay for school tuition and life these days. Yes, and this can really affect the way students relate to their education. But it's important to remember that education is about more than just preparing for a career. Not everyone who studies philosophy or art history or languages has to go on to be a professor of these things. I have. And I'm enormously grateful that I have the opportunity to do what I do for a living. But you don't have to study these things professionally in order for them to be huge and positive influences on your life. You can have a rich involvement with the arts and humanities even if you're a neurosurgeon or a computer scientist or an investment banker at Goldman Sachs. But it doesn't come for free. The arts and humanities are an extraordinary resource, but you have to develop the skills to recognize their value. A good education in the arts can do that for anyone, no matter what his or her professional aspirations. How can we draw on your teaching in regards to the current religious wars? I don't want to lecture to people, but I was thinking something this morning that's related to it. I was thinking about the fact that part of the value of a lot of these humanistic projects is that you start to recognize that people who have different worldviews can be and should be infinitely interesting to one another. And that when you come into genuine interaction with someone who's very different from yourself, and you try to understand them - really try to understand them and engage with them - it changes you not only substantively because you'll start to understand your commitments differently, but it also changes you through the very process of engagement. Opening yourself up to someone else who's very different from you is a process that allows you to take a different stand with respect to yourself, and I do think that that is one of the many things that's getting papered over in our culture - the genuine value of interacting with people. Well, 'papered over' in the sense that people have lost track of it. This is one of the things that the Greeks were very good at, and so it's at the root of one of the differences between the Greek tradition and the Judeo-Christian tradition. The Homeric Greek tradition was polytheistic - there were lots of Gods. Every culture that you came into contact with had its own range of gods, and there were of course wars. There were lots of ways in which it wasn't a great time to live but one of the really interesting things that you see at the heart of Homer's work, for instance, which happens to be the oldest Greek work that we have, is that even though people from different cultures had very different pantheons of gods, ways of life, and understandings of what was and wasn't valuable, there was this idea that if some stranger came to your house, it was your duty to protect them. It was your duty called upon by the gods to be grateful to the fact that they've arrived, to recognize in this the possibility of extraordinary new alignments, extraordinary new understandings of the world and of yourselves. They valued strangers, and that value of strangers was the one thing that all the different cultures in the ancient Greek world shared, and that's not what we have now. In fact, it’s sort of the opposite of what we have now and I do worry that it's much harder to have that when the religious traditions that are focusing the culture are monotheistic instead of polytheistic, because the monotheistic traditions are the ones that demand that our view is the view that's right, it's the only view that's right, and it's the view that everyone else has to share. I think that makes it very difficult for the culture to recognize the value of interaction with people who are very different from us. What courses are you teaching this fall? A course on a book by Martin Heidegger called Being and Time, maybe one of the most important philosophical texts of the 20th Century in my view, though others will disagree, and in the spring I'm going to teach a lower division course on Existentialism in film and literature from Pascal in the 1630s to the 1960s. In the past, we've looked at three films: Hiroshima Mon Amour, Godard’s Breathless, and The Third Man based on the Graham Greene screenplay. I try to avoid the news (laughs). I used to read the news a lot. I literally stopped reading the news for quite a while so that I could focus on things that I thought had a longer history than the last twenty-four hours but I do now, as I have in the past, listened to NPR and I look at the New York Times and the Boston Globe, mostly. There are lots of websites - political websites - that I used to read that I've sort of weaned myself from. One thing that I love that I haven't been to as many times as I'd like is the First Monday performances at the New England Conservatory which are free at 8 pm, and you can bring your kids if you have kids. Laurence Lesser organizes them, and our older son is a cellist, so we went to hear Lesser play the complete Bach cello suites. We made it through the first one, but it was just a great experience in Jordan Hall. Another is the Actor's Shakespeare Project. They perform Shakespeare plays in Somerville but also non-Shakespeare. They're professional actors who come together a few times a year, outside of their regular lives, to do these plays. WHEN can we expect your next book to be published? Oh, that's a terribly hard question. I don't know. It's nowhere near finished. It'll be a while.